Revolutionary design yielding high power to weight ratio. 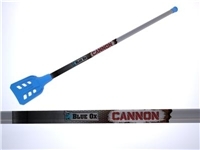 This stick is made in the United States by Blue Ox Gear, LLC (Minnesota engineers & broomball players) for broomball players. 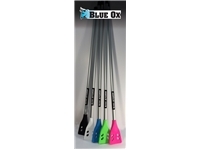 A C405 aluminum alloy shaft crimped at the end and runs the length of the head for maximum energy transfer. 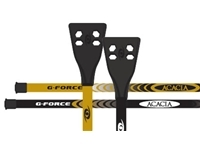 The largest face area of any broom on the market with flat sidewalls on the perimeter of the broom head. Great styling and graphics. These guys really paid attention to the details and incorporated the Blue Ox branding and logo in several areas of the broom. 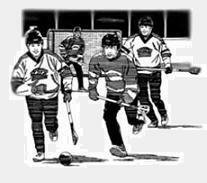 Approved for use by USA Broomball & Canadian Broomball Federation. No guarantees or returns on broomball sticks. Made in the U.S.A.
good stick overall. wouldn't recommend for forward but great for defense. I suggest not to put to much tape on because it makes it heavier. Where to start.... This stock is great. Even thought the Edge has the same head shape and is lighter, I think that this stick is match better balanced than the edge. The head has a great design with a large amount of surface area. 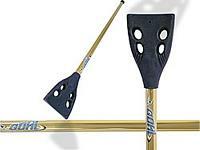 This stick is great because I play defence and this stick gives me a wider area to stop balls.